Robert Dugoni is an American author best known for his Tracy Crosswhite crime mystery series. The Robert Dugoni books in order are easy to catch up to if you are new to the Tracy Crosswhite since there are only a handful of books currently written: six main books and two novellas. The author also has a second, shorter series called David Sloane, which includes five books, with the latest one published in 2012. This one is a legal thriller series and if you like John Grisham, you will enjoy David Sloane. 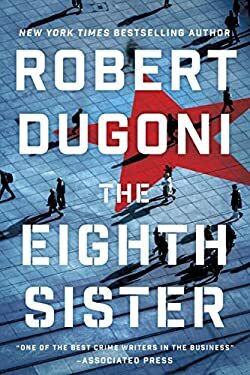 Finally, in 2019, Robert Dugoni has started his third series titled Charles Jenkins, with a first book published in April with the title The Eighth Sister. Here are the Robert Dugoni books in order for his two popular series to be read in the right chronological order. I will list the publication order as well for each book. Robert Dugoni was born in 1961 in Idaho and was raised in Northern California. He is currently living in Seattle, Washington. He always knew that he wanted to become a writer. He grew up as the middle child among other nine siblings, so he often liked to retreat to solitude and write. Also, being among so many kids, he once joked that he never got a chance to actually speak. He knew he wanted to become an established author by the seventh grade. Robert Dugoni attended the Stanford University, where he majored in communications/journalism and creative writing. At the same time, he was also working as a journalist for the Stanford Daily. After graduation with the Phi Beta Kappa honor from the university, he went to work for a while at the Metro Office and the San Gabriel Valley Office of the Los Angeles Times. Next, he went to the UCLA School of Law, after which he began working as an attorney at Gordon & Rees in San Francisco. He remained there for 13 years until one day, in 1999, he decided that writing is what he wanted to continue doing. So Robert Dugoni packed his stuff and moved with his family to Seattle, where he began writing his first novel in a small windowless office. It took him three years to complete his debut novel. His first successes started with failure. After submitting his manuscripts and getting rejected over and over again, Robert went to the local bookstore’s How To section focusing on writing books and started to devour them and taking notes at the same time. He read writing books by Lawrence Block, Christopher Vogler, and Saul Stein among others. He also went to seminars held by established authors that had something to teach them about the art and craft of writing. His books have so far received several awards and were nominated for some others. He won the Pacific Northwest Writer’s Association’s Literary Award two times, and he won the Nancy Pearl Award for Fiction in 2015 for his novel My Sister’s Grave. The Cyanide Canary, his non-fiction expose book was a Washington Post 2004 Best Book of the year. Dugoni was also twice nominated for the Harper Lee Award for Legal Fiction and was a thriller of the year finalist for the 2015 International Thriller Writer. The author’s books have been so far sold in over 20 countries and they have been translated into several languages including German, French, Spanish, and Italian. When not writing, the author Robert Dugoni is teaching writing skills to his students across the US in his novel writing intensive course. Reading the Robert Dugoni Tracy Crosswhite series in order is quite entertaining. The first book introduces us to Tracy, a detective who is forever searching for the killer of her sister, Sarah. The book climbed the #1 Amazon Bestseller list of Amazon in the United States, France, Italy, Germany and in the UK. It also went on the Bestseller list of the New York Times and Wall Street Journal, and it was extremely well received both by critiques and readers alike. Tracy Crosswhite had a very small role in one of the David Sloane books, namely in Murder One. Before starting the new series, the author Robert Dugoni decided to revisit his first series and see which character would speak to him most. He chose Tracy, and the rest is history. While the David Sloane series is a legal court drama, with Tracy Crosswhite, Dugoni went into another direction exploring the crime mystery genre. The first novel still has traces of legal mystery within, however, the rest of the novels are pure detective mystery books. I highly suggest you read the Robert Dugoni books in order for both his series, not so much for the storylines but for the character development and interaction. The author mentioned in an interview that he might just go back to writing yet another David Sloane book, although he doesn’t know when.